When Patch Adams invited me to join his tour, I agreed for several reasons. I saw it as an opportunity to do something for someone else by stepping out of my comfort zone. I felt this would give me a chance to break away from my dependable, predictable life, and everyday demands. Once in Russia, I knew that the living and clowning would have my full attention. Deep down I wanted to know if I could do this. Patch has been going to Russia every year for about 17 years, bringing the joy of laughter, happiness, compassion and hope to thousands of Russian people. My first experience as a clown was when I attended a one day clown workshop with Patch several years before. I discovered that I loved giving to people and as a clown, even if some people appeared unwilling at first. So in early November last year I set off on my journey to Russia, so many people asked me: "Russia! Why Russia?" From the moment I arrived, I discovered many answers to their question. I knew November was not going to be the best time of year to be in Russia because of the cold, bleak weather. In fact we did not see the sun for the two weeks we were there. To me, Russia was like stepping back in time - the magnificent buildings, the history and the people. Even as an outsider, I could see the extremes of wealth and poverty everywhere and yet the people we met were warm and friendly. Patch also has a network of friends in Russia who share his commitment to work tirelessly to help others at their personal expense. The trip to Russia was very long and tiring. I flew to Stockholm and then to Moscow. 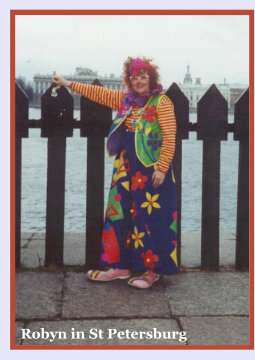 This was my first time in a foreign country dressed as a clown. I can still remember the day I stepped out of the Hotel dressed as my clown character Carrottop in Stockholm to catch a cab to the airport. As I walked down this quaint narrow street, two businessmen were walking towards me. Any other time I would have looked away, but not this day. I looked straight at them smiled and said good morning in my strongest Australian accent and they responded with a laugh and a very big smile. The response I got from these strangers encouraged me and boosted my confidence to meet up with the other clowns who were waiting for me at the airport in Stockholm. Also knew to me was the experience of walking in authentic clown shoes. I had never before ventured more than 20 paces in them and discovered that they were like trying to walk with tennis rackets strapped to my feet. I don't know who laughed the most at the airport, my fellow travellers or me as I tried to negotiate these shoes into the narrow plane aisle. Later that evening all the clowns met up at the hotel in Moscow to get acquainted and make plans for the following day. The clowns came from all over the world, from Wales, Italy, Holland, France and the United States. I was the only clown from Australia. 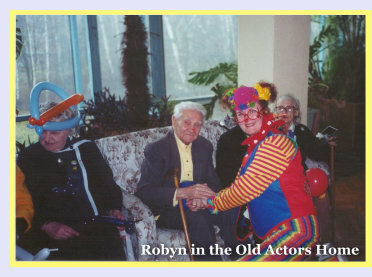 Our first visit was the Old Actor's Retirement Home. The residents were told the clowns were coming that day to visit and they were so excited. We left the bus together making all sorts of musical sounds and up the path to the home we went. We laughed, sang, danced, hugged and cried together for about three hours. Language was no barrier. We communicated through actions of love and compassion. We gave to them, but more importantly they gave us an experience we will never forget and always treasure. We travelled all over Moscow and St Petersburg visiting hospitals and orphanages, where the children were delighted beyond belief. The children in the orphanage for the disabled, tore at our heartstrings and left us sad and speechless. We gave to them all we had, but sadly there was never enough time. They loved the clowns but responded equally well to our hugs, smiles and the unconditional love we gave to them in our brief time together. When we visited hospitals, we played with the children and gave them little gifts we had brought from home. We sang songs, painted their faces and made balloon animals. We showed them our family albums we brought with us and some of the children were able to talk about their homes and families. Every where we went the children were excited to see us. We brought colour and joy, which transformed their drab surroundings in the middle of winter. Love, laughter, dancing and hugging transformed their otherwise sad and lonely existences even if only for a brief period of time. And I will always remember one little boy in the hospital that pulled on my coat as I was leaving and said "Please don’t go and take the magic with you". It was interesting to discover that the children have a parent or family member who stays with them, to help look after them while they are in the hospital. The parents of the children also cried at times with joy and happiness that we had brought a little ray of sunshine into their child's day. The children we saw in Russia, like so many children throughout the world, responded to laughter and fun. I felt privileged and humbled to be a part of it all. 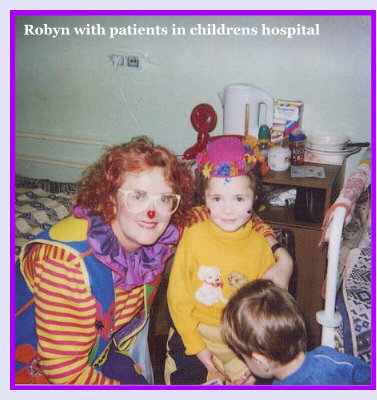 I went to give to the children and I also wanted to find out what it would be like to be a clown all day, everyday. To do goofy things, to laugh, hug a stranger, play catch the balloon in the subway, make people smile, laugh, cry and surrender to the moment of love and hope. I did all this and more and I saw how laughter, fun and love can change so many things. The trip to Russia, for me, was so full of emotion. It has been eight months since I returned and I can still feel a knot in the pit of my stomach and become tearful when I recall the experience. There are 600,000 orphans in Russia, who are victims of a system I know we cannot change. Yet, for a short time, I know that we as clowns, did make a difference. My lasting memory is the expression of joy on the children's faces when they saw the clowns - and Carrottop amongst them.